Pity the poor pumpkin. Unappreciated, disrespected, ignored, except at Halloween and Thanksgiving. They’ve been growing all summer, not looking much like pumpkins, but now they’re in season and adorning fields all over Lancaster County, reminding us that fall is upon us. Riding along Route 340 to the east or north on Route 501, we see pumpkins piled up on tables at the roadside stands. Most of us think of pumpkins as jack-o-lanterns, and most of the pumpkins we see along the roads are the large, round “jack” pumpkins into which we carve scary faces, but which are mushy and tasteless. Then there is the Sugar Pie. Smaller, sweeter, denser pumpkins with fewer seeds and no hollow space, Sugar Pies have flavor that almost explodes in your mouth. Sugar Pies are available at many local farm markets, or they are easy to grow yourself (but that’s a topic for next spring). There are some who will tell you that pumpkin is one of those foods that is better (read: easier) from a can. I don’t buy that. Cooking a fresh pumpkin is as easy as, well, pie! Simply split the pumpkin in half, remove the seeds and strings, rub the skins with olive oil, and roast for an hour. Scoop out the flesh, allow it to drain in a colander lined with a dish towel for an hour, and then puree in a food processor. A 4-pound Sugar Pie pumpkin yields about 4 cups of cooked pumpkin. You can even do it ahead. Bug don’t just make a pie–do something wild. Search your cookbooks or the Internet for a tasty main dish. We’ve used this one, Pumpkin-Mushroom Lasagna, adapted to our taste from The Moosewood Restaurant Celebrates cookbook, several times. It is a sweet and savory dish that is earthy and fragrant, a great dish to serve to company, and, the leftovers are amazing. In a large pot, sauté the onions in the oil for 5 minutes. Add the mushrooms and sauté another 5 minutes, until the mushrooms begin to wilt. Add the sage, ½ teaspoon salt, wine and stock, and simmer on low heat for 5 minutes. Set aside. In a large bowl, stir together the pumpkin, eggs, ricotta, pepper, nutmeg, and ½ teaspoon salt. Set aside. Preheat the oven to 375 degrees. Lightly oil a 9×13 baking dish. Dip out a bout ½ cup of the liquid from the sautéed mushrooms and pour into the prepared baking dish. Cover the bottom with a layer of noodles, arranged closely together. Evenly spread half the pumpkin mixture. 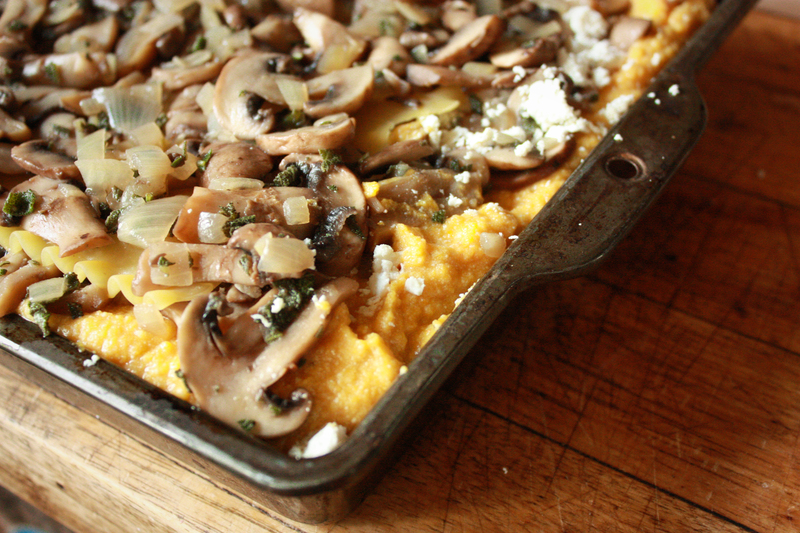 Spoon on about 1/3 of the mushrooms and sprinkle on ½ cup feta. Repeat this with another layer of noodles, pumpkin, mushrooms, and feta. Finish with another layer of noodles, the remaining mushrooms, feta, and top with grated Romano. Cover with foil and bake for 50 minutes. Remove the cover and bake for an additional 10 minutes, until the lasagna is bubbly, the noodles are tender, and the top is browned. Remove from the oven and let stand for 10 minutes covered before serving. Finally, don’t neglect the seeds. They’re rich in fiber, vitamins B and E, and make a great snack. Roast them in the oven with a little olive oil and salt or get fancy and use a chili rub or other seasoning you have on hand. Roast for 40 minutes in a 325 degree oven, stirring occasionally.